We offer a wide array of TEMO patio covers, ensuring we have a style that will complement the architecture of your home. Every patio cover we offer is engineered to stand the test of time, as they are resistant to warping, peeling, fading, cracking, chalking, scratching, and denting. Additionally, they are incredibly easy to maintain, only needing an occasional rinse with soapy water for a like-new appearance. If you want to enjoy enhanced protection from the sun without being fully shaded, our pergolas are the perfect choice for you. We offer a fantastic selection of styles to choose from, including free-standing, garden arbor, and attached, as well as an operable pergola, which has a roof that can be fully lowered for full coverage from the sun. This style pergola allows you to enjoy the best of both worlds, as you can enjoy warm sunshine when you want it and full shade when you need it. 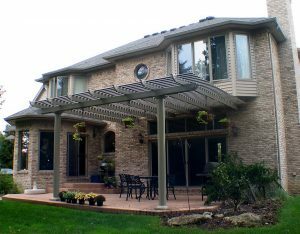 Furthermore, just like the patio covers we offer, our pergolas are incredibly durable and easy to maintain, allowing you to spend more time enjoying your new home upgrade and less time worrying about its upkeep. When you partner with us for your outdoor living structure, you can rest easy knowing our highly skilled and background-checked installers will take care of the entire installation for you. We are so confident in the work we complete, we back our labor with an impressive lifetime service warranty. Are you ready to get one step closer to enjoying a stylish and practical outdoor living area at your property in or around the Lincoln, IL, area? If so, don’t hesitate to call AAA Window – Siding Roofing today. We’ll gladly answer any questions you have and schedule you for a complimentary consultation.